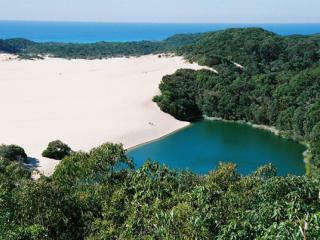 Your Fraser Island tour travels North past the Glasshouse Mountains to the seaside town and coloured sands of Rainbow Beach. 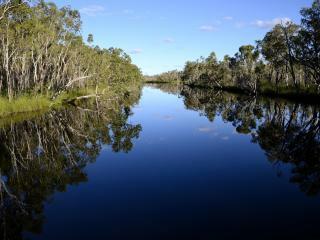 Look for Dolphins, Turtles and Dugong as you ferry across to Fraser Island. 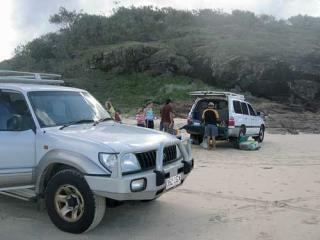 4WD Fraser Island's 75 mile surf beach with an eye out for dingoes, sea eagles and whales. 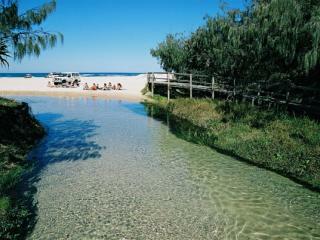 See the crystal clear waters of Wanggoolba Creek and Central Station, 4WD to Eli Creek, Cathedral Beach and Indian Head. Drive to Lake Wabby, and experience the deepest lake on the island. Travel to Eli Creek and enjoy floating with the current. Overnight accommodation in an eco friendly campsite or at Eurong Beach Resort. Your 3 day Kingfisher Bay Eco Resort tour departs Brisbane and Noosa and travels north to Rainbow Beach & the coloured sands before crossing over to Fraser Island and magnificent 75 mile Beach. 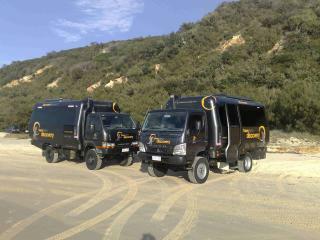 This tour will take you north to Indian Head where you can spot sharks, dolphins, turtles and whales from the lookout. Enjoy the facilities and accommodation of Kingfisher Bay Eco Resort. Visit the home of the Crocodile Hunter, located near the Glasshouse Mountains on the Sunshine Coast. This extraordinary zoo's main 'stars' are the Saltwater crocodiles, Australia's largest and most dangerous predators, with daily feedings from October to March. The zoo also features anacondas and alligators. Watch the playful tigers, and catch the thrilling free flight bird show too. Other exciting shows include the Asian Otters, cuddly koalas and snakes. 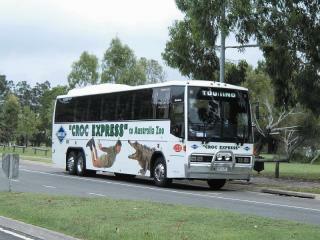 This day tour goes directly to and from Australia Zoo, home of the late Crocodile Hunter, Steve Irwin. Now a living legacy to Steve, Australia Zoo is a wildlife adventure to good to miss! Spend 6 hours, seeing the many shows and demonstrations available. See wild crocodile feeding in the Crocoseum or see the handlers play with the tigers at the Tiger Temple. Through Rainbow Beach to Inskip Point, we embark on the barge to Fraser Island... a brief crossing that may delight you with sightings of playful dolphins. Travelling 75 mile beach is an exciting experience as we navigate the pristine sands towards Eurong Village, then the off road terrain into the island's core. The Noosa Everglades BBQ Lunch River Cruise is perfect for those who enjoy spending time with nature, spotting native wildlife and cruising along pristine waters. Alternatively take the canoe option to this tour (Bar-B-Canoe) and paddle your canoe upstream to really appreciate the serene atmosphere of the Noosa Everglades. Re-join your tour group for an Aussie BBQ Lunch and visit to the historic Harry's Hut. There is plenty of time to take photographs, go for a swim or just relax and enjoy the surrounds.